The adoption of the Euro 5 standard for diesel and gasoline has been driven by the market, state regulation and European example. Despite large numbers of vehicles in the country still running on engines that do not meet modern European standards, Russia is forging ahead with progressive legislation on environmentally friendlier types of fuel. Although Russia does not have to fully switch to Euro 5 standard diesel and gasoline until January 1, 2016 (Europe did it in September 2009), major oil companies in Russia are already selling the new specifications of fuel. As oil company representatives have told RBTH, Lukoil has been producing only Euro 5 diesel and gasoline since the beginning of 2012. Gazprom Neft and Rosneft are slightly falling behind and switched some of their refineries to that standard only in 2013. 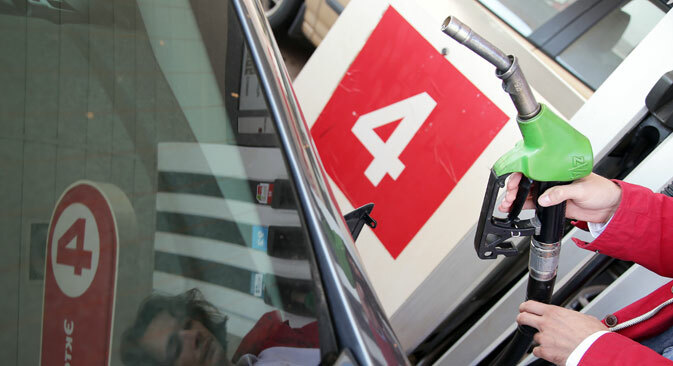 According to a National Energy Institute analyst, Alexei Frolov, the main factor driving Russian oil companies' switchover to Euro 5 is not environmental concerns but savings on excise duties and a growing car market that demands increasingly more better-quality fuel. According to the state technical regulations, the production of Euro 3 gasoline and diesel in Russia should be phased out by January 1, 2015 and of Euro 4, by January 1, 2016. If in 2013 producers paid excise duties of $160 per ton of Euro 5 and $285 per ton of Euro 3, in 2015 the difference will become even bigger: $180 for Euro 5 and $375 for Euro 3. Russian car manufacturers too are in a hurry to meet environmental standards in a struggle to compete with their foreign rivals, who are taking over an increasing share of the Russian market. For example, Russia's biggest carmaker, AvtoVAZ, told RBTH that all Lada cars made for the domestic market now meet the Euro 4 standard, while all Lada cars to be exported are already compliant with Euro 5. Given that starting from January 1, 2014, the import of cars below the Euro 5 standard into Russia has been banned, experts polled by RBTH believe that Russia may reach the international level in a couple of years' time and the switchover to Euro 6 will be accomplished with just a small lag behind Europe, where it is set for 2015. Having said that, for many more years the Russian car market and oil companies will have to deal with the Soviet legacy of old trucks, which fail all environmental standards, and with low oil-refining efficiency. Yevgeny Arsenov, deputy head of the Institute of Transport Economy and Policy under the Higher School of Economics, explains that the Soviet automotive sector, which the Russian automotive sector succeeded, always followed what Europe did, but very selectively, especially as far as the environment was concerned. "The first fuel standard to be introduced in the 1970s concerned CO emissions and was very lenient. Why? Because it covered vehicles that at the time were produced inside the country. Technologically, the Soviet Union was some 20-30 years behind Europe," Arsenov says. The deep economic crisis that followed the breakup of the Soviet Union pushed the introduction of the Euro 2 standard in Russia many years back: It came into force only starting from 2006, 11 years after it was introduced in Europe. The transition to Euro 2 marked an end to the era of very environmentally unfriendly carburettor engines in Russia and a move to injection engines (in which fuel is injected right into the engine, reducing the level of harmful emissions). There is a paradox there because the fuel injection system was first tested in Russia as far back as prior to the 1917 Bolshevik Revolution. In 2006, only three oil refineries in Russia produced Euro 3 fuel. This is quite understandable since, in experts' estimates, in 2006, only 1 percent of Russia's 24 million vehicles complied with the Euro 3 standard. According to Avtostat news agency data, as of January 1, 2014, there were already 39.3 million cars in Russia. Of them, 43 percent meet Euro 0 and Euro 1; 13 percent, Euro 2; 15 percent, Euro 3, and as many as 28 percent, Euro 4 and Euro 5 standards. Interestingly, Russia now has cars that meet the Euro 6 standard too, although so far they account for just 0.0005 percent of the total number of vehicles in the country. Although the fleet of passenger cars in Russia is being upgraded quite quickly, a considerable part of the fleet of light commercial vehicles still fails to meet environmental standards, while their owners prefer to maintain old vehicles rather than buy new ones. According to Russian Automotive Market research, over 40 percent of buses, 20 percent of commercial vehicles and over 50 percent of trucks in Russia are more than 20 years old. "The only region that has taken radical steps to upgrade its fleet of vehicles is Moscow. Over the past two years, the city has bought a large number of vehicles meeting the Euro 4 standard and higher," says Yevgeny Arsenov. "Other Russian regions simply cannot afford to buy new vehicles, so they are interested not so much in the environmental category as in the cost," he adds. Another thing that Russia has inherited from the Soviet Union, in addition to old and environmentally unfriendly transport, are "old and energy inefficient oil refineries that occupy a lot of space," according to Ivan Senchenya, managing director of Environ, which offers environmental consulting to major Russian companies. These refineries, which were the foundation of the Russian oil industry, were unable to ensure a high refining depth (Depth of refining, a term used primarily in Russia, is an efficiency factor that indicates how much crude oil is processed into petroleum products - gasoline, oils, rubber, fuel oil, etc. The higher refining depth is, the less waste there is and therefore the less damage to the environment). In Soviet years, priority was given to increasing oil production, so refineries were engaged mainly in primary distillation. "Traditionally, oil companies did not use advanced equipment because there were no incentives for them to do that. From the point of view of environmental standards, the product mix of gasoline they produced was totally unacceptable," says Yevgeny Arsenov. The incentives came in the form of new excise duties on petroleum products that were introduced in 2011 and that for the first time ever were linked not to the octane number but to the environmental category. Yet here too there is a "but". Even though the main oil companies are now producing Euro 5 diesel and gasoline, refining depth at their plants remains low. At Lukoil refineries, it varies from 64 to 93 percent; at Rosneft, from 54 to 72 percent. At Gazprom Neft's Omsk refinery, it is about 91 percent. The government plans to bring this figure for the whole of Russia to 90 percent by 2020. However, plans, as was the case with the introduction of Euro 2, can be pushed back more than once.